Mysuru: Kannada bibliophiles are having a field-day at the 83rd Kannada Sahitya Sammelana as they thronged the nearly 200 book stalls from day one itself. The bookstalls are located bang on the cricket pitch and right next to the main venue on Maharaja’s College Grounds where well-known publishers from the State have set up their stalls. The books by the eight Jnanpith awardees from Karnataka, novels, poetry, drama, literature, Vachanas, Sharana Sahitya, Science, Children’s literature, Dalita Sahitya, Religion, Chutuku Sahitya, you name them they are available. The book-lovers were seen making a beeline to the book stalls from morning itself on day one and buying books of their choice. In the afternoon the crowd had thinned and picked up again in the evening. The books costing as little as Rs.10 to about Rs.2,000 are on display and sale. Discounts are being offered on books from 10 per cent to 50 per cent. Books published by Prasaranga, University of Mysore, Kuvempu University, Hampi Kannada University, books by litterateurs and writers are all available. Books as cheap as just Rs.10 for five books, Rs.100 for ten books are catching the attention of the people. Hence, everyone who is visiting the stall is picking up at least one book. 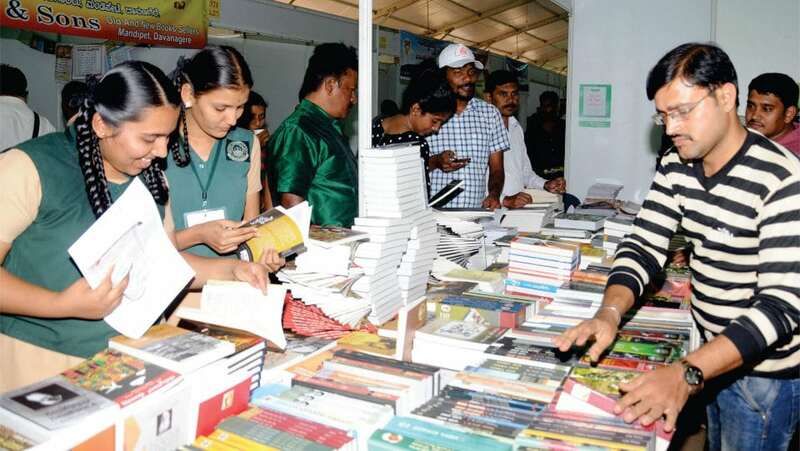 Some of the well-known names in publishing who have set up stalls include Bengaluru’s Sapna Book House, Bengaluru Press, Sahitya Bhandara, Sahitya Sthamba, Saidurga, Vidyanidi Prakashana from Gadag, Chetana Book House from Mysuru, JSS Granthamale, Roopa Prakashana, Navakarnataka Publications, Melkote’s Samskrita Samoshadana Samsath Publication, Basava Samiti Prakashana, Akshara Prakashana, Talukina Venkannaiah Smaraka Granthamale, Karnataka Vijnana Parishat, Kannada Ganaka Parishat, Kalaburgi’s Patil Book Sellers, Basaveshwara Book Depot and Stuti Publication. In Shivamogga’s Geethanjali Pusthaka Prakashana stall the book ‘Kuvempu Sahitya Padavivarna Kosha,’ is a dictionary that includes words from Kuvempu’s poetry, dramas and short stories. The eight volume dictionary costing Rs.3,600 is being sold at a discounted price of Rs.2,900. The books by Kuvempu, Da.Ra. Bendre, Shivaram Karanth, U.R. Ananthamurthy, books on Buddha, Basava and Dr. Ambdekar have great demand, said Bengaluru publisher Basavarajappa.